The image shows the city of Irkutsk (centre left) and part of Lake Baikal (right). Last month marked the anniversary of Sentinel-1A (Friday 3 April 2015). Sitting in the south of Russian Siberia, Lake Baikal is considered to be one of the oldest lakes in the world and the largest lake by volume, containing over 23,000 cubic km of freshwater. Home to thousands of species of plants and animals, the area was declared a UNESCO World Heritage Site in 1996. Much of the wildlife is considered to be endemic. Irkutsk is one of the largest cities in Siberia and a popular stop on the Trans-Siberian railway because of its proximity to Lake Baikal. 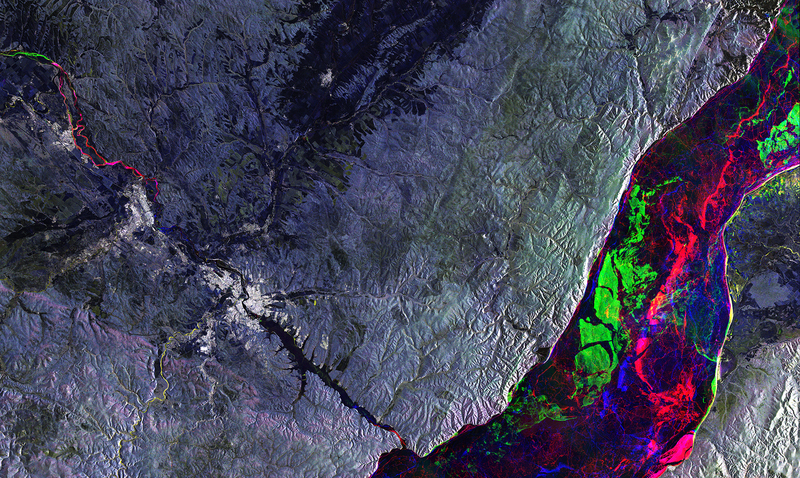 This image combines three radar scans from the Sentinel-1A satellite on 11 January, 4 February and 24 March 2015, with each scan being assigned a colour: red, green and blue. The colours present in Lake Baikal and the Angara River show the location of ice on the different dates. Sentiel-1A is the first satellite for Europe’s Copernicus environment monitoring programme. The satellite is used to care for many aspects of our environment, from detecting and tracking oil spills and mapping sea ice to monitoring movement in land surfaces and mapping changes in the way land is used. UK involvement in the Sentinel mission is funded by the UK Space Agency. The heart of the satellite’s radar, the Integrated Central Electronics package, was supplied by the UK from Airbus Defence and Space (formerly Astrium) and is one of the most advanced units of its type in the world. In March (2015), Dr David Parker, Chief Executive of the UK Space Agency, signed an agreement for the UK to host a Sentinel data hub which will be jointly funded by the UK Space Agency and the Satellite Applications Catapult. This will ensure the UK is ready to fully exploit the Sentinels’ operational data as soon as it becomes available. BELLISSIMA IMMAGINE DELLA CITTA' IRKUTSK E IL LAGO BAIKAL, GRAZIE.